Refreshments in the Courtyard & Gardens - Come and join us! With a lovely view of St Peter and St Paul Church Spire, our Refreshments in the Courtyard & Gardens are just a stone’s throw from Olney Market. Escape the bustle of the Market Place to enjoy delicious refreshments and a friendly welcome! Take a gentle stroll around our idyllic 18th century Georgian gardens. 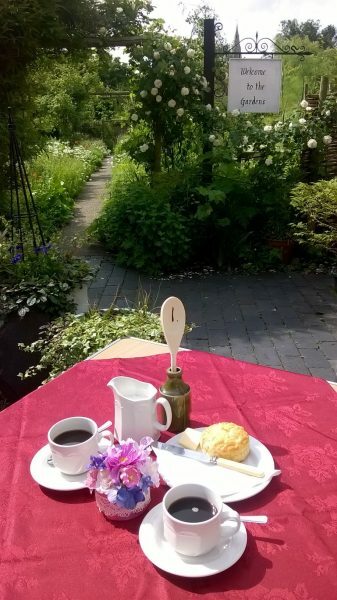 Enjoy tea or coffee and a homemade cake in Cowper’s charming Courtyard. All proceeds from refreshments go towards the upkeep of our local Museum, so please support us as often as you can. This fortnightly event takes place throughout the summer of 2019. Did you know that our Annual Pass, (adults £7 / children under 16 years free) gives you 12 months from the date of issue to visit the house and gardens as often as you like?